The Mongoose in title is a bat not a beast. The new Mongoose bat is supposed to give the batsman an unfair advantage. BBC calls the Mongoose bat the first major redesign since 1771. The good news for CSK fans is that they have chosen Hayden as their brand ambassador. If the bat is anything as the website touts, Haydos is bound to better his performances in the last season. In the promotional event today, Haydos has also confirmed that hew will be using this bat. I predict his strategy would be to start batting with the traditional bat and start using Mongoose bat after the first break. One thing is certain - We can expect much more DLF Maxmiums from Hayden this season. IPL , indian premier league is big tournament. With lots of publicity going , on sports items like cricket bats. 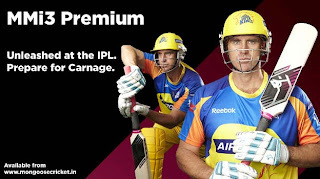 I think , mathew hayden, is best person, for publicity of mongoose bat.